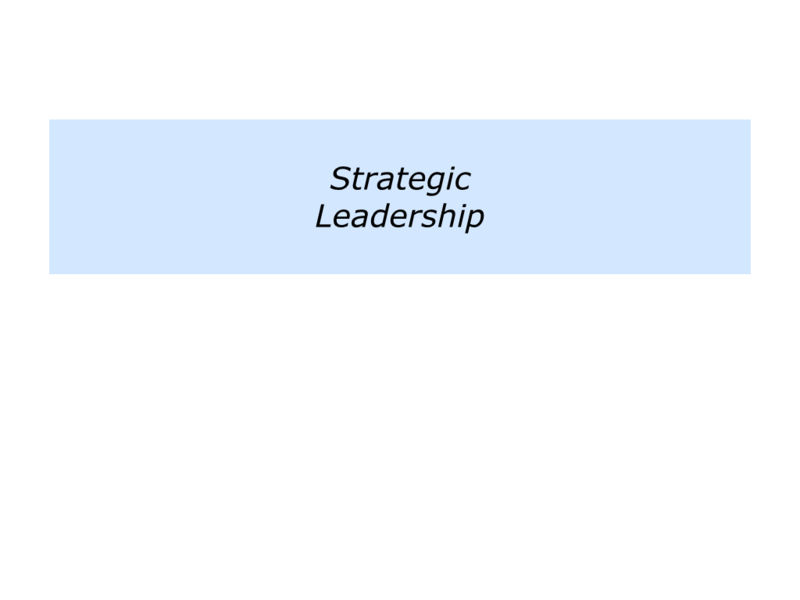 There are many approaches to leadership. 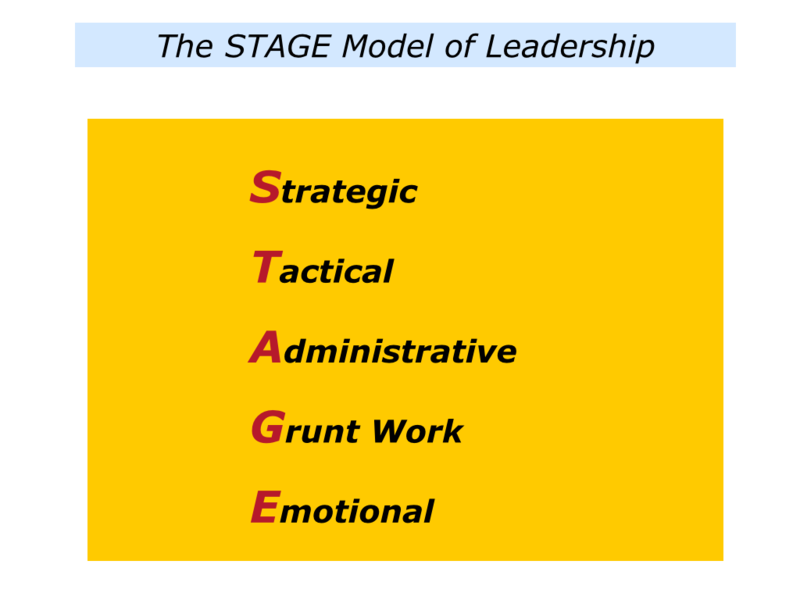 The STAGE Model covers the Strategic, Tactical, Administrative, Grunt Work and Emotional aspects of teamwork. 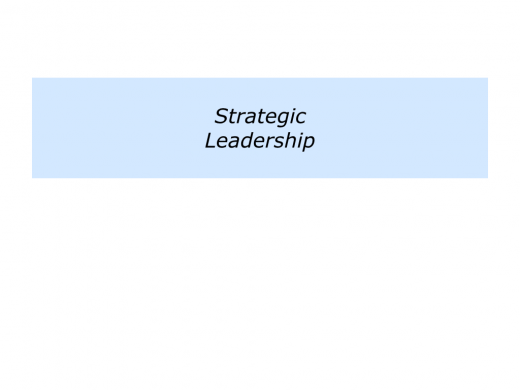 This model works well for leaders whose strengths lie in strategic and emotional leadership. They can focus on these aspects, whilst working with others who can manage the TAG part. Imagine you are a leader who has such strengths. 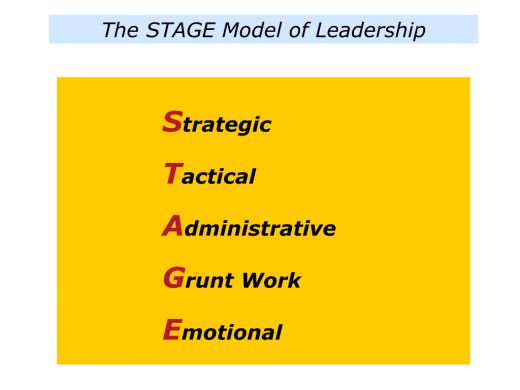 Here are some themes to consider when following the STAGE model. 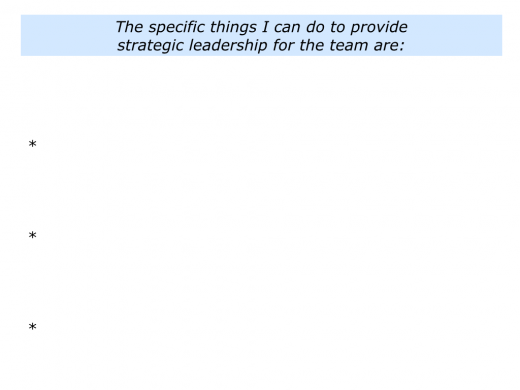 Great leaders keep communicating the team’s strategy. Your job is to keep people’s eyes on the following themes. The What: The specific goal the team is aiming to achieve. The Why: The specific benefits of achieving the goal. The How: The specific strategy for achieving the goal. The Who: The specific responsibilities of various people in working to achieve the goal. The When: The specific milestones along the road towards reaching the goal. It is important to keep communicating the big picture, especially when it gets tough. This helps people to make a link between their daily actions and the long-term picture of success. If you wish, try tackling the exercise on this theme. Imagine you are a leader. 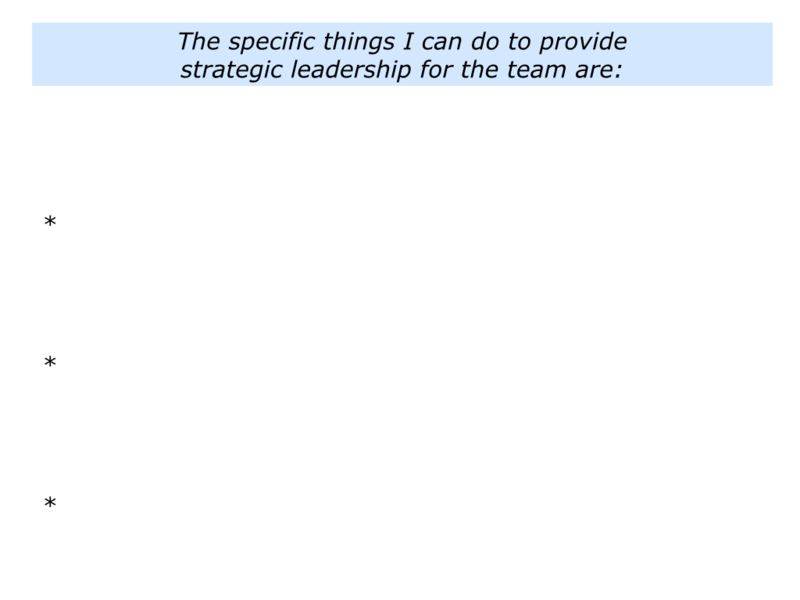 Describe the specific things you can do to keep providing the strategic aspects of leadership. 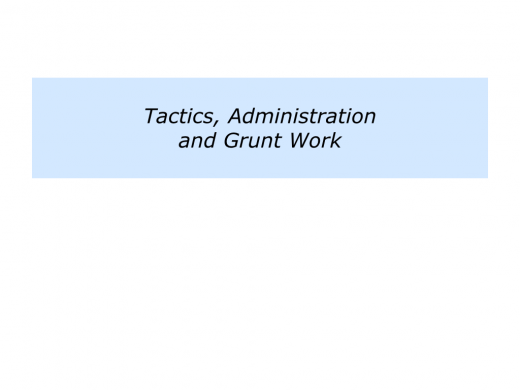 Great leaders may have grand strategies, but these must be translated into action. As a leader, you can try to do everything yourself, but you will then be doomed to failure. Your job is to focus on the strategic and emotional leadership. 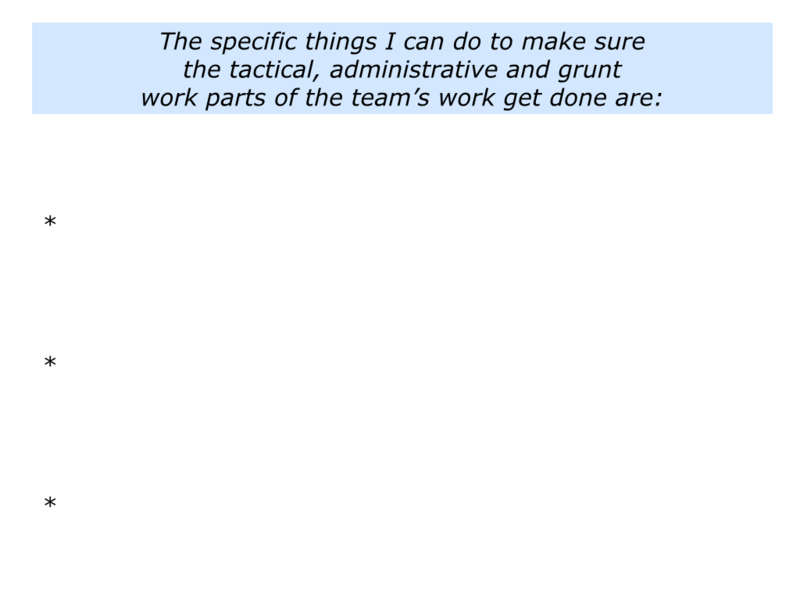 Great teams often have a superb co-ordinator. So, if possible, get a co-ordinator to oversee the TAG part. Otherwise the danger is that you will keep dipping down into the detail and fall into fire fighting. The co-ordinator’s job is to oversee three things. It is to ensure that grand plans are translated into tactics that contribute to achieving the goals. It is to ensure that diaries are kept up to date, meetings scheduled and the hygiene factors managed, otherwise the team falls into chaos. It is to ensure people are encouraged, equipped and enabled to do the daily tasks and that these are completed. 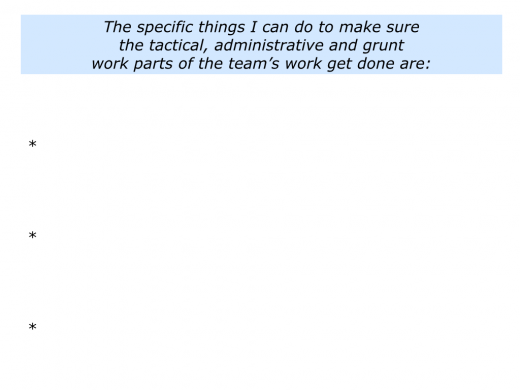 The co-ordinator may not actually do all the work themselves, but they do ensure it gets done. “Must it be one person?” somebody may ask. Yes, they can. But be wary of having too many people who report to you directly. The danger is that you will turn into a micro-manager, rather than operating as a leader. If you wish, try tackling the exercise on this theme. Imagine you lead a team. Describe the specific things you can do to ensure the TAG part gets done. 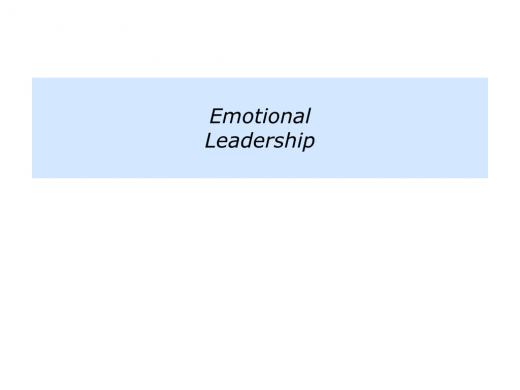 Great leaders harness people’s emotional energy to achieve the goals. Different leaders do this in different ways. Some are good in ‘one-to-many’ situations. They give inspiring speeches and provide rallying calls to action. Some are good in ‘one-to-few’ situations. They prefer small groups where they can listen, connect with people’s agendas and find positive solutions. Some are good in ‘one-to-one’ situations. They provide the personal touch, make individuals feel valued and encourage them to do their best work. Great leaders play to their strengths and few are good in all situations. Some are good as strategic leaders, for example, but fail to provide the necessary emotional leadership. They often work best in tandem with somebody who can connect with people emotionally. There are many approaches to leadership. The STAGE model is just one. The keys are the strategic and emotional parts. Great leaders inspire people to put their hearts, as well as their heads, into achieving the picture of success. If you wish, try tackling the final exercise on this theme. 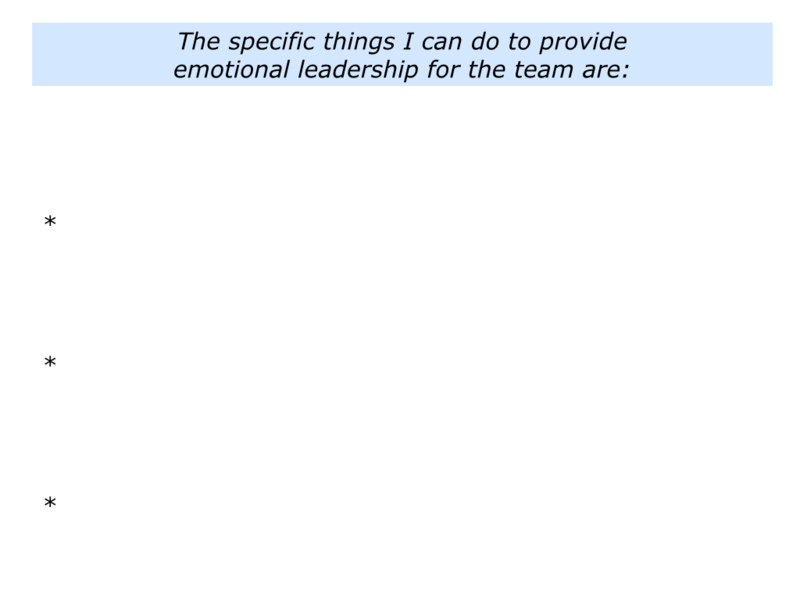 Bearing in mind your strengths, describe the specific things you can do to provide the emotional leadership for your team.